You are here: Home / Bread / Pizzetta Toast – quick, easy and gluten free! Today I’m bringing you Pizzetta Toast which uses the Tiger Artisan Bloomer from Newburn Bakehouse by Warburtons. 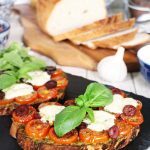 My Pizzetta Toast gives you all the flavour of pizza but with none of the time and hassle of making your own pizza base so perfect for a quick, light lunch. My son has asked me to teach him to cook this summer as he is heading off to university and this is definitely a recipe I will be teaching him! He has never shown any interest in cooking unlike his younger sister so I was really surprised that he chose to go self catering! Anyway I digress, the Tiger Artisan Bloomer is the fifth and latest addition to the Artisan range from Newburn Bakehouse which joins the Classic White Artisan Loaf, White Sourdough Artisan Cob, Seeded Sourdough Artisan Boule and Breakfast Artisan Cob. 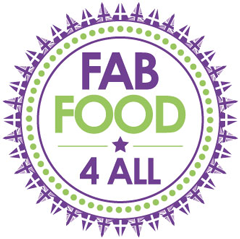 Newburn Bakehouse are known for their extensive ‘Free From’ range which includes wraps, hand crafted Artisan boules, rolls, crumpets and sandwich thins. With 1 in 100 people now living with coeliac disease and 13% of Brits cutting out gluten it’s great that Warburtons listened to their customers and decided that they shouldn’t have to miss out on one of life’s luxuries ie artisan bread. Artisan means a high quality and distinctive product, made in small quantities, using traditional methods such as hand moulding. 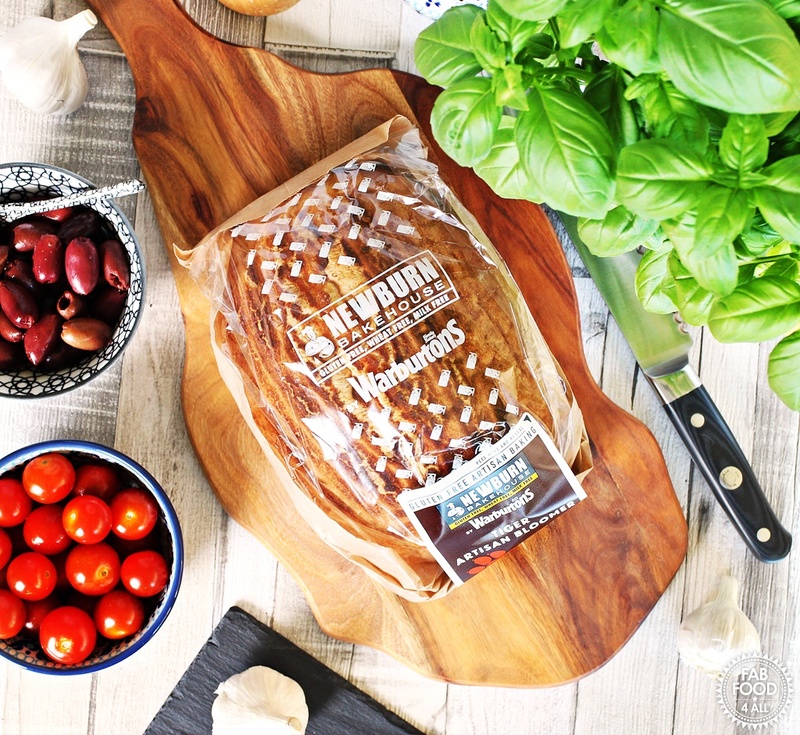 The artisan loaves made by Newburn Bakehouse are all hand finished so every loaf has its own distinct look. I really like the new Newburn Bakehouse Artisan Tiger Bloomer and the flavour of the tasty crust seems to be magnified on toasting so is well suited to being made into Pizzetta Toast! I do hope you try my recipe which is quick and simple to make whether it’s just for one or a whole family! You might also like to check out my Avocado Stuffed French Toast with Poached Egg! 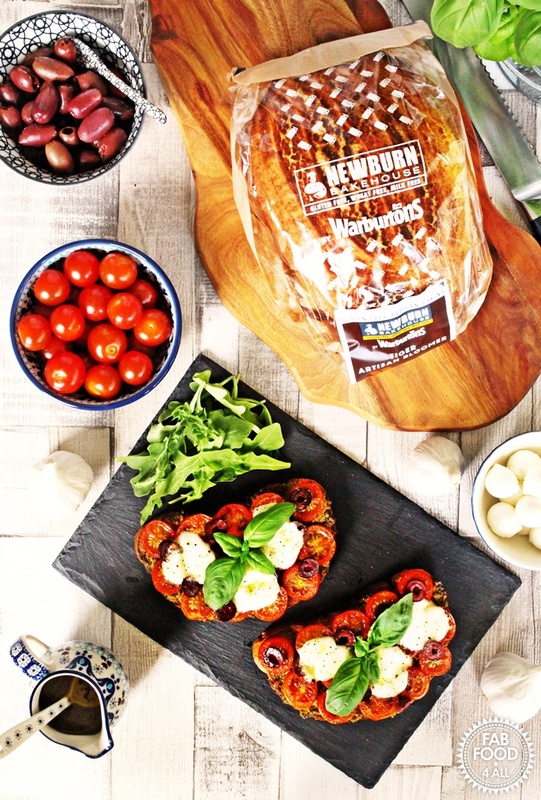 The Newburn Bakehouse Artisan Tiger Bloomer is available exclusively at Sainsbury’s, you can check out Newburn Bakehouse for your nearest stockist. 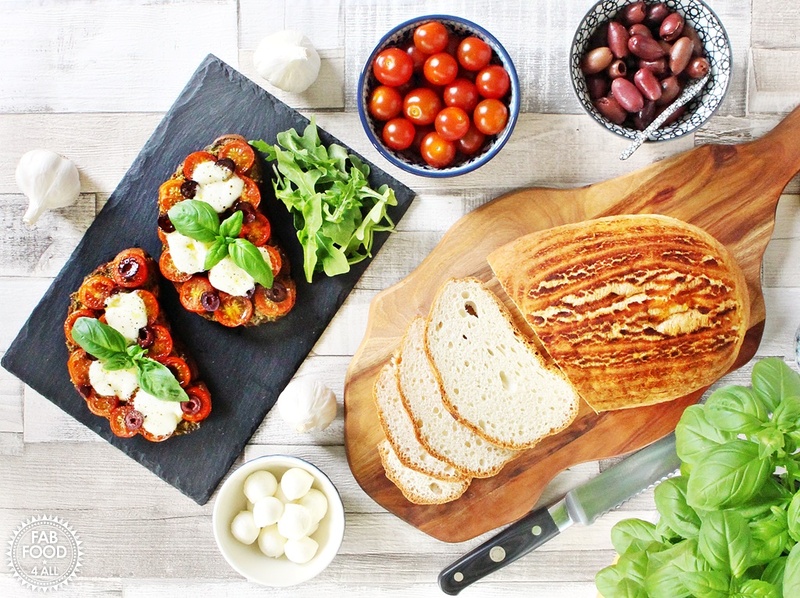 Pizzetta Toast - quick, easy and gluten free! 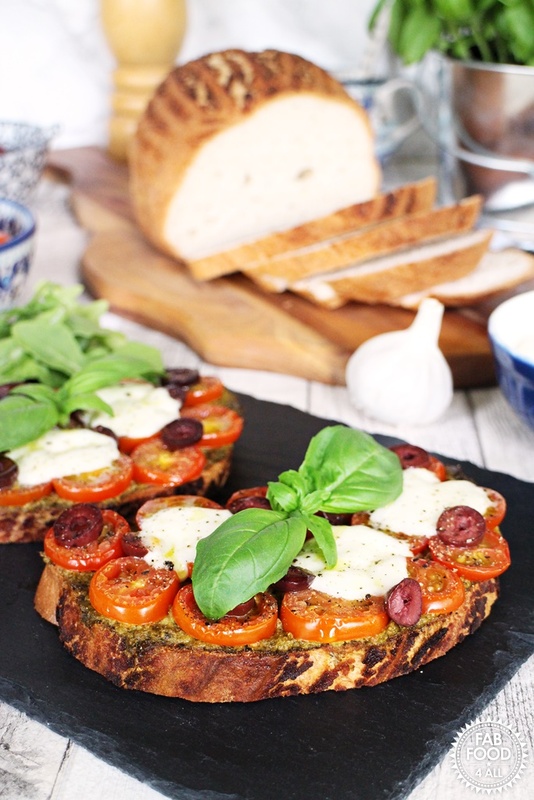 Pizzetta Toast is gluten free and topped with garlic, pesto, cherry tomatoes, Kalamata olives, mozzarella cherries and drizzled with extra virgin olive oil for a really tasty light meal. Start by toasting your bread (if making more than two Pizzetta Toasts use the grill). Rub the garlic all over one side of the toast. Spread the pesto over the toast. Place the sliced tomatoes in a single layer over the pesto. Next scatter over the Kalamata olive slices. Then place the mozzarella cherries on top. Drizzle with extra virgin olive oil and a good grinding of black pepper. Place pizzetta toast under the grill until the mozzarella melts (about 4 – 5 minutes). Drizzle with a little more oil if wished and garnish with basil. Enjoy with salad for a light lunch. NB: This is a sponsored post in partnership with Newburn Bakehouse by Warburtons. Previous Post: « 2 Ingredient Slow Cooker Roast Lamb – so easy! This sounds absolutely delicious! 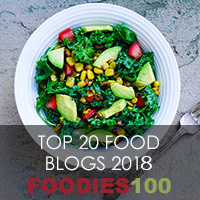 I’m looking for new, easy recipes… so this is being tried out, soon! This looks like the perfect convenient lunch when you’re hungry and need food ASAP!